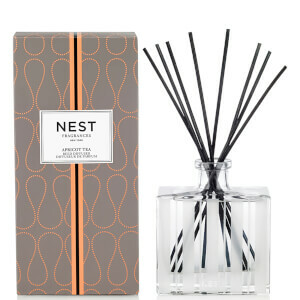 NEST Fragrances present the Grapefruit Reed Diffuser. Housed in a luxurious frosted glass bottle, the concentrated essence is made from premium quality oils, designed to disperse slowly and evenly into the air to fill your abode with a rich and long-lasting aroma that lasts up to 90 days. Zesty and effervescent, sweet accords of Pink Pomelo Grapefruit are blended with watery green nuances for a clean and fresh scent. Lily of the Valley adds a touch of delicate florals, while Coriander Blossom brings a hint of spice. Presented in opulent branded packaging, the reed diffuser makes an ideal gift. 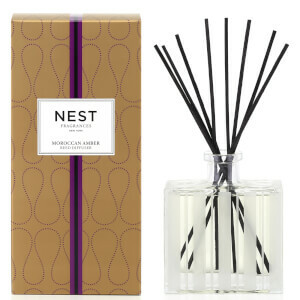 I really enjoy the scent from the nest reed diffuser. The scent could be stronger, seems to fade, I flip the reeds often. Best use is in a small bathroom, keep door closed too intense the sense. I recommend but only buy when on sale 20% off! I placed this reed diffuser at the top of my stairway and everytime I pass by I get a delicate whiff of freshness. It is not too perfumey, and has lasted several weeks still going strong-but not too strong!